Check out the 2019 summer beach events posted in the RMR Calendar!! Contract Signing Policy for 2019 – 2020 Girls Division Only Approved 8/24/18 RMR Junior Forum and Ratified by the RMR Board of Directors 8/28/18. The time period from the day after the 2019 Girls JNC (July 7, 2019 at 12:00 am MST) up until 10am MST on the 3rd Friday in July as a tryout period for clubs. Clubs can hold tryouts after the 3rd Friday in July if they choose to. Note: an offer given by a club to a player from another club, by any means of communication (email, verbal, text, etc) will not be considered a binding offer. Only written contracts sent from the club to the prospective player starting at 10am MST on the 3rd Friday in July will be considered binding, once signed and counter signed. No written contracts or request for deposits can be requested of a player until 10 am MST on the 3rd Friday in July. Clubs can accept written contracts after 10am MST on the 3rd Friday of July, these contracts will be considered binding, once signed and counter signed. Verbal commitments to own club players can be made after the ZBT. Verbal commitments to club members not affiliated with your club may be made the day after the final date of competition of the Girls Junior National Championships ( July 7, 2019 12:00 am MST). Note: verbal commitments are not binding, but they will allow players to know that a contract will be offered. Schedules are now posted on tm2sign.com for the Power Mixed and Odd Event on Sunday, April 14th. Power has been revised 4/12/19 in the 15's and Mixed Age Divisions. Play in the HS National Beach Championships! The RMR does not dictate whether teams or participants should or should not travel in any inclement weather or other conditions. Club/Team travel to any RMR event is always at your own risk and expense . In the event of road closures (verifiable by State Patrol) due to inclement weather on the date of the tournament, it is the responsibility of the Club/Team Representative to notify the Tournament Director that the team will not be participating in the tournament. Only notify the RMR Office if the Tournament Director can not be reached. The team will forfeit all matches which will result in receiving last place in that division. If deemed appropriate, the Junior Committee of the RMR Board of Directors may reimburse tournament entry fee (s) based on the above noted criteria. Congratulations to 303 VBA 18 Boys Mizuno and Front Range 17 Boys on earning bid to the 2019 Junior National Championships. See "Boy" tab for more info. 9news covers the birthday celebration of Fran Zelinkoff one of the founders of the Rocky Mountain Region USAV. Fran has actively participated in the growth of the RMR for the past 40 years. Thanks Fran for your dedication, we would not be here without you. Congratulations to all teams who represented the Rocky Mountain Region at the Girls' Junior National Championships in Detroit, MI! 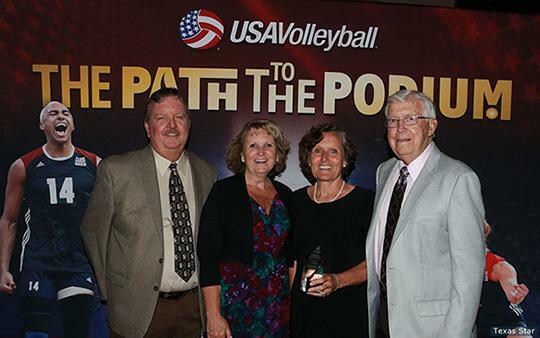 Joan Powell honored with USA Volleyball's “Frier” Award! DALLAS (May 23, 2018) – USA Volleyball honored Joan Powell with its Harold T. Friermood “Frier” Award, the highest honor bestowed by the national governing body, during the Dorothy C. Boyce Awards Recognition Banquet Wednesday evening in Dallas. Powell has enriched the lives of countless people within the volleyball world, whether as an administrator, player, high school coach, referee, teacher of the game or simply a mentor over the last 40 years. Powell was one of 17 recipients honored at the Boyce that showcases the sport’s legendary athletes, coaches and administration. A year after graduating from University of Arizona, Powell became involved with USA Volleyball in 1974 and has been an active member ever since. As a player, she received regional all-star honors seven times and led her Colorado Connections team to three USA Volleyball Open National Championships titles in the 30-and-Over Division. Powell was selected USA Volleyball All-American five times. Powell’s interest in officiating emerged from a college class while attending Arizona in the early 1970s. That one class led to an officiating opportunity while still in college and a long-standing refereeing career was born. She was a PAVO nationally certified official for nearly 40. In 1987, Powell earned her USA Volleyball national referee patch and stayed active for 27 years. Along the way, she has officiated the NCAA Division I, Division II & III championships several times, including multiple semifinal and title matches. Her latest NCAA championship was in 2009. Powell’s administrative role in the sport has kept her active. She served five terms as president of PAVO, starting in that role in 1997. She was selected as the first NCAA National Coordinator of Officials in 2011, thus forcing her to let go of her NCAA whistle. In this new role, Powell coordinated officials’ assignments, nominations and advancement process for the Division I, II and III NCAA Volleyball Championship committees. She served as a consultant to the NCAA Volleyball Rules Committee while also developing educational tools for over 3,000 officials nationwide, coordinating clinics throughout the country and editing the annual referee exam. In April of 2016, Powell took on the role of coordinator of women’s volleyball officiating for the Pac-12 Conference – a similar role she held at the Rocky Mountain Athletic Conference prior to her job with the NCAA. Powell has served on the USA Volleyball Board of Directors and completed two terms on the National Association of Sports Officials Board of Directors. She has previously served on USA Volleyball’s Rules Committee. Powell’s involvement in volleyball was not squarely in officiating or administration – she had a full-time volleyball job outside those realms for many years. She retired from a 32-year high school volleyball coaching career after the 2006 season. Her final 30 years coaching was at the helm of Coronado High School in Colorado Springs, Colorado. Powell led Coronado to four state championship titles and coached hundreds of athletes along the way. And she excelled teaching in the classroom as well. In 1998, Powell was named Disney Teacher of the Year. Her educational background and coaching skills combined to form another avenue to reach the volleyball community. Since 1989, Powell has been a cadre member in USA Volleyball’s Coaching Accreditation Program since its inception. She has mentored other volleyball coaches to become better coaches. Joan has authored numerous officiating and coaching articles, including two chapters for two coaching books. Powell has also been to the Olympics. In 2008, she served as the team leader for the U.S. Olympic Women’s Volleyball Team at the Beijing Olympic Games after serving in the same capacity at the 2008 Pan Am Cup and 2008 FIVB World Grand Prix. Powell has received several honors for her service. In 1999, she was selected as both the George J. Fisher Leader in Volleyball and Karen M. Johnson Human Resources Award winner. In 2009, Powell was honored with the Glen G. Davies Referee Service award. And in 2014, she was bestowed the Joseph B. Sharpless Arbitrator’s Award for her event arbitrator work at USA Volleyball National Championships events. Powell has been inducted into seven Halls of Fame. Check out the Junior Clubs that will be offering Sand Programs. Joining a Beach Program is a great way to get started in the sand. Information can be found on the Beach Tab. Registration forms for the RMR Beach Series and RMR Beach Regional Qualifier have been posted. Both Events are open to everyone you do not need to qualify. Beach Series events are similar to indoor Power Events. RMR Beach Regional Qualifier, the top 2 teams from each age group will receive bids to the USAV National Beach Tour in Florida. Congratulations to Momentum 18 Sanchez Boys and 303 VBA 16 Neo Boys on winning the gold at the Dennis Lafata Boys Bid Event this past weekend. Each team earned in their respective age group in the USA Division. The RMR is excited to learn that CHSAA has approved Boys' Volleyball as a Pilot Program. Great job to all who helped advocate for this program. Here is the link to the Mountain Series Event happening on Sunday, March, 4th. Keep up to date with RMR Junior Power Events. All schedules and results can be found at this link tm2sign.com. ©2019 Rocky Mountain Region Volleyball / SportsEngine. All Rights Reserved.